I’ve reached the moment in the cottage, “Sybi’s, design plan, where a rug is needed. Of course, I’m not looking for any rug, no, this must be a knock your socks off, moment of pause, followed by a heavy sigh - rug. I realize, it’s a tall order. I know the perfect rug is out there, rolled up complete with bindings, patiently waiting on me. With determination, I’ll discover it. Rugs are often where designers begin their design process. 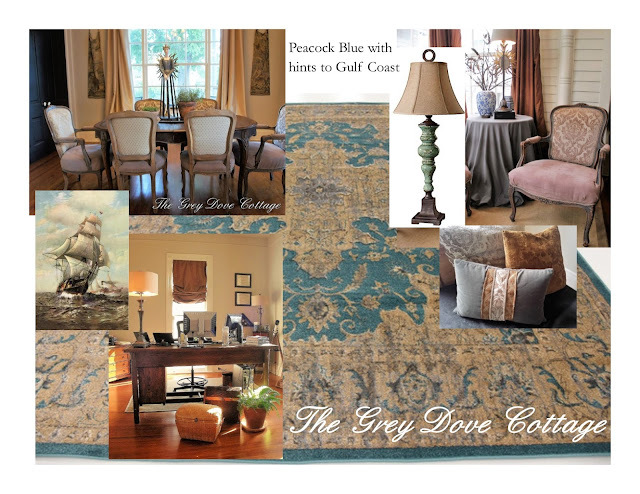 Finding a rug that the client adores then using that rug to design a room, or entire home. Varying the color pallet from room to room is a design method that works well, allowing rooms to flow. Above, a stunning dining room by designer, Gerrie Bremermann, the warm tones of the rug are repeated in the table finish, and gold leaf on the French mirrors, also the soft grey upon the frames of the French mirrors, the cream seat slips, and frames of the antique chairs. Each color used in the room can be found in the rug. 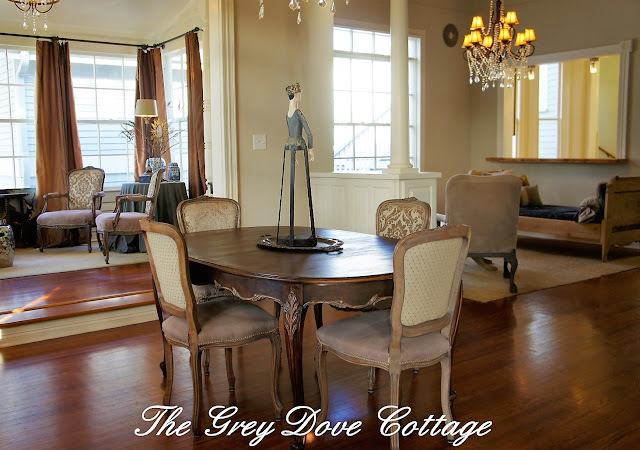 She used a round center medallion rug, paired with a round table. Brilliant. Stunning. The cottage has an open plan. With an open plan comes challenges. Rooms need to “play well” with another. Achieving a flow without drenching your home in a single-color is difficult. In addition, I am a neutral girl, I adore a neutral pallet, which is difficult to create, because neutral may become boring. 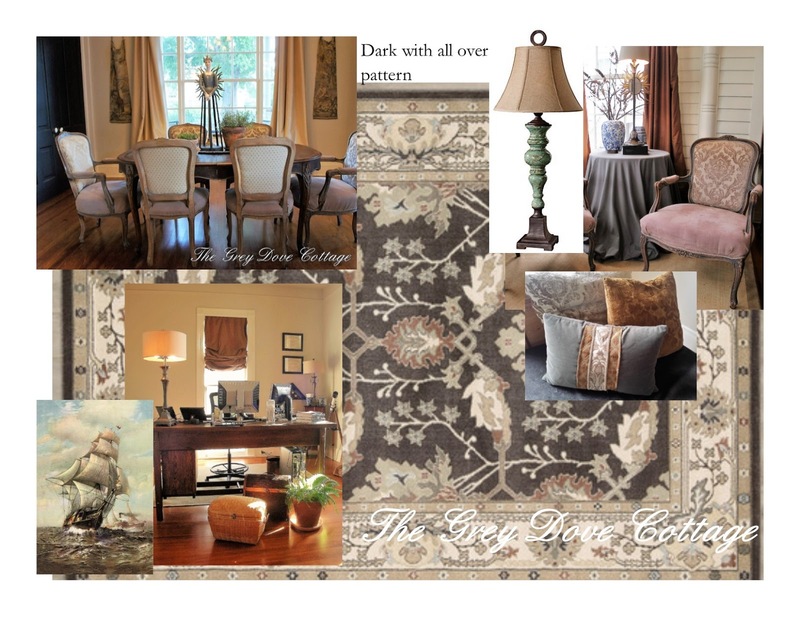 A well designed neutral pallet requires layers of texture, also pattern is key. I’ve used thick seagrass for texture in the foyer, as well as the keeping room. Mr. GDC’s home office has a flat seagrass mat beneath his roller chair. That pass thru window will hopefully be gone soon. Our walls are Sherwin Williams Accessible Beige, bathing Sybi in a soft neutral greige. 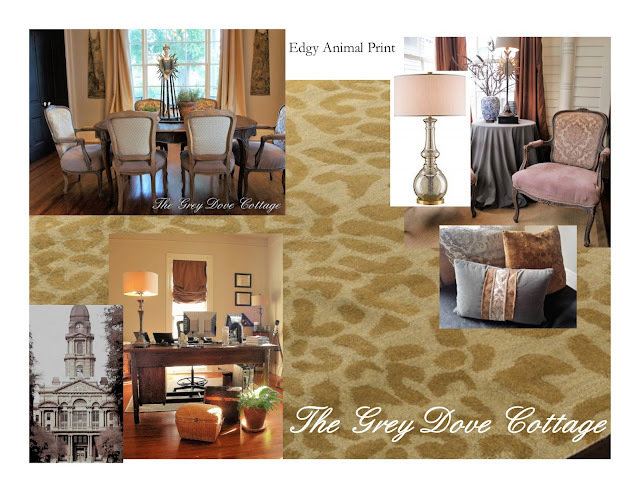 Our primary color scheme is taupe, khaki, charcoal, with accents of caramel. 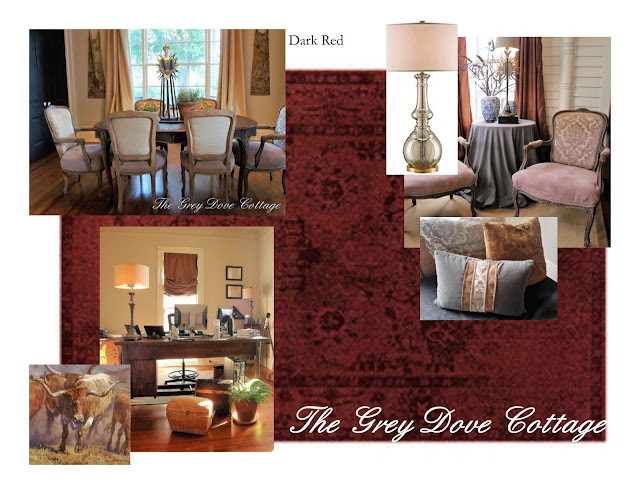 Our design plan includes leather, velvet, silk, faux fur, embroidery, also chenille patterned fabrics. For added interest some furniture pieces are rustic country, while others are edgy contemporary. These elements work together to create an interesting neutral pallet. With the foundation in place, I'm ready for art, an accent color, also accessories. The next layers should follow a rug purchase. 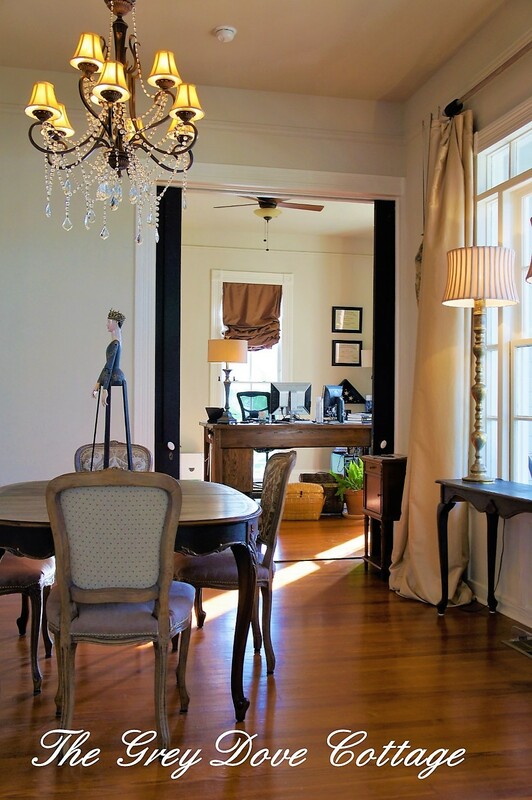 Since the dining room is a bit “center stage” the room is key to our design plan. Petite, with four athways the rectangular space is 13 feet by 11-feet. Our oval, antique, French style dining table, allows easy passage from various rooms without the treachery of bumping into table corners. Paired with vintage French chairs dressed in soft grey frames, then covered with three patterns of fabric. The room has two six foot openings on either end, an eight foot French window to the front side of the cottage, finally another six-foot opening to the remainder of the cottage. The tapestry remnants gracing the small walls flanking the large French window are muted with age. 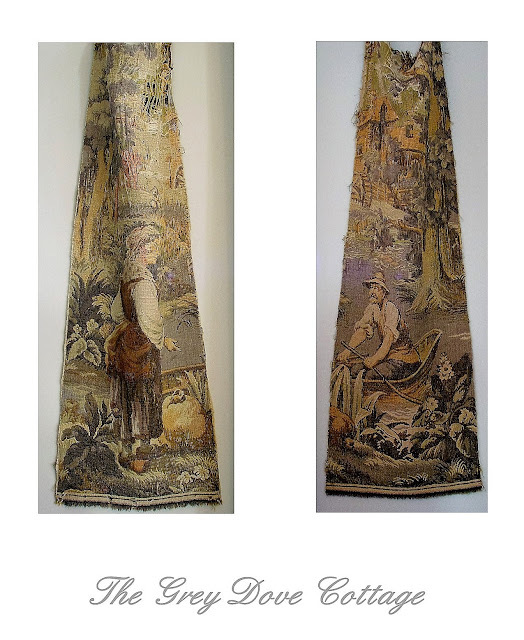 The tapestries are on of my favorite treasures, one during a Belgium online auction. I want them to continue to have presence. I must be mindful of color as well as pattern in the rug choice. 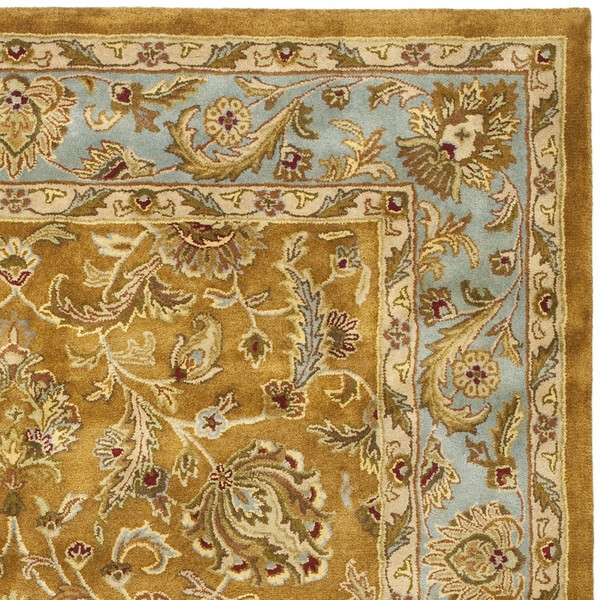 Dining room rugs are a special challenge; a rug should extend a minimum of 24” from the table edge on all sides. This additional space allows chairs to be pulled out. 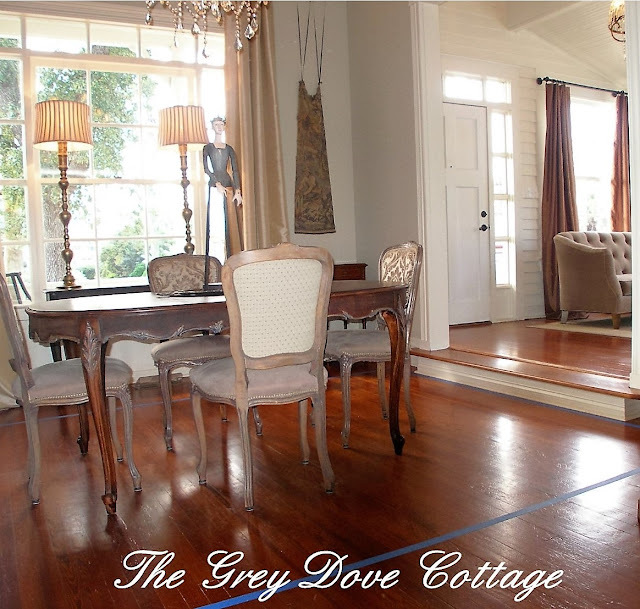 If you have a table with a leaf, it is best to add the measurement of the leaf when determining the length of the rug. A rug too small results in chairs falling off the rug when scooted out. Unfortunately, the legs catch the edges of the ill fitted rug as guest attempt to settle about the table. The rug should be wide enough, the chair may pull out with the back legs remaining on the rug. Size is critical; in the above photo the masterful Suzanne Kasler has the rug fitted to lay just in front of the buffet, also the fireplace. This leaves a hint of wood flooring. There is plenty of space for chairs to pull out, as well as leaves to be added to the table. 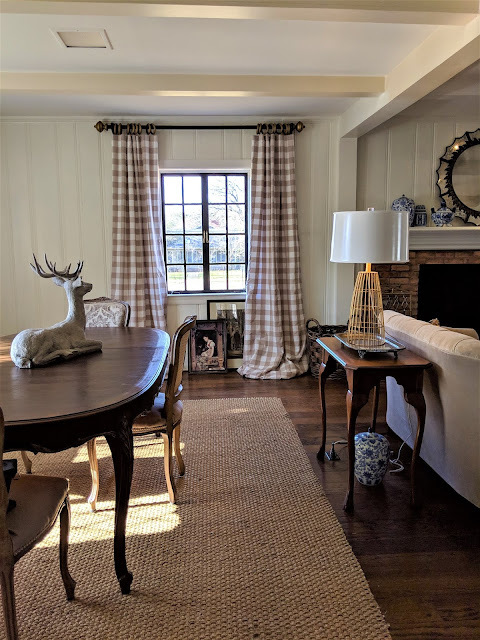 Our dining room is a petite space leaving few options; a 9 X 12 will be “wall to wall” at the length of the room, leaving wood floors alongside the rug on the width. This exaggerated length will ensure that when a leaf is added to the dining table, the end chairs will remain upon the rug. There is a step down from our foyer to the dining room, as people enter feet will fall upon the rug, preventing them from tripping on the edge of a smaller rug. Shape is an important consideration. Some people prefer to match the shape of their rug to the shape of their table. I prefer to match the room shape. Square room; round or square rug. Rectangular room, rectangular rug. Regardless of the table shape. A trick; use painter’s tape to tape off the floor, allowing you to visualize where the rug will be. Also, keep in mind that rug measurements are estimated; a 9’ X 12’ may be 106” wide rather than 108”, and the length is commonly in the high 130 range rather than the actual 144” suggested by the 12’ length. Manufacturer, country of origin both affect the actual size. Take care to look for the actual dimensions. 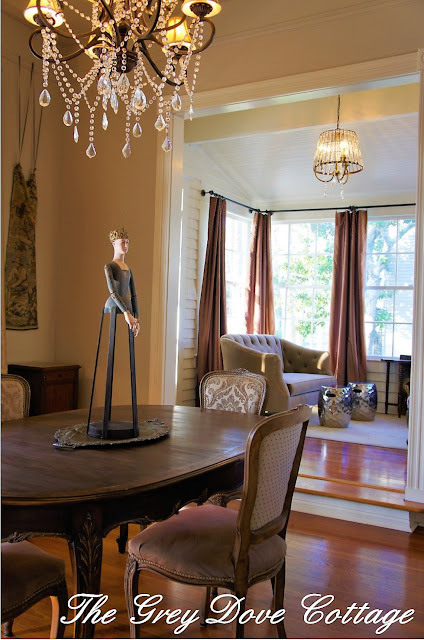 I find a flat weave rug, or thin rug is best suited for dining rooms. Previous experience of a thick wool rug, paired with a rug pad resulted in an antique Chippendale chair disaster; the stretcher being ripped from its seat frame, as someone attempted to scoot back from the table, without picking the chair up. Shiver. Lesson learned. I use a ½” thickness with a protection mat, no pad. Consider the dining room is utilitarian; chairs are scooted back and forth, the table covers most of the rug, food stains are going to occur, cleaning will be needed, a thin rug suits the space best. Thick rugs are better suited for foyers, sitting or living areas, also bedrooms where bare feet may dance on a thick, plush rug. 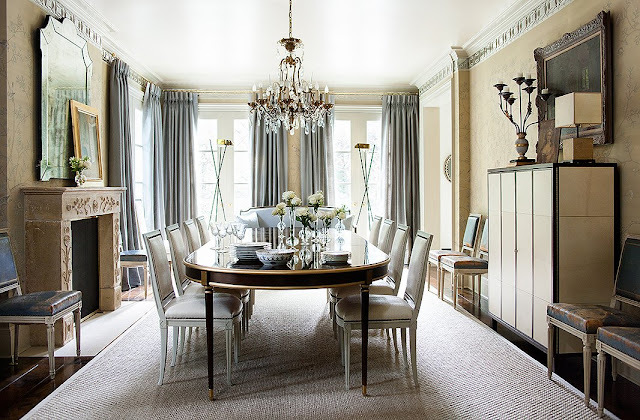 Another dining room dilemma is material; wool, silk, natural blend rugs may not be best suited for the dining room. Wool is certainly the best wearing for longevity, especially in foot traffic areas. Wool is thick with a dense pile, as shown above. Wool is not that easily cleaned; cold water is a must to prevent shrinkage, oxi base cleaners will pull the color from your wool rug. Your favorite Shiraz waterfalling to the floor from the edge of your dining table, will not only cause your heart to cringe, but may permanently stain your rug. 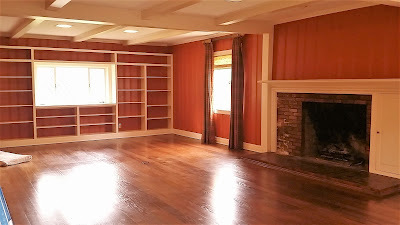 Some suggest a synthetic rug, Mercerized, or soaked in Scotch Guard as a must in the dining room. Curious; does Scotch Guard really guard against a spill of scotch? What about Shiraz? Pattern should be considered, the more pattern the better the camouflage for stains. Keep in mind that the dining table will cover most of the rug. 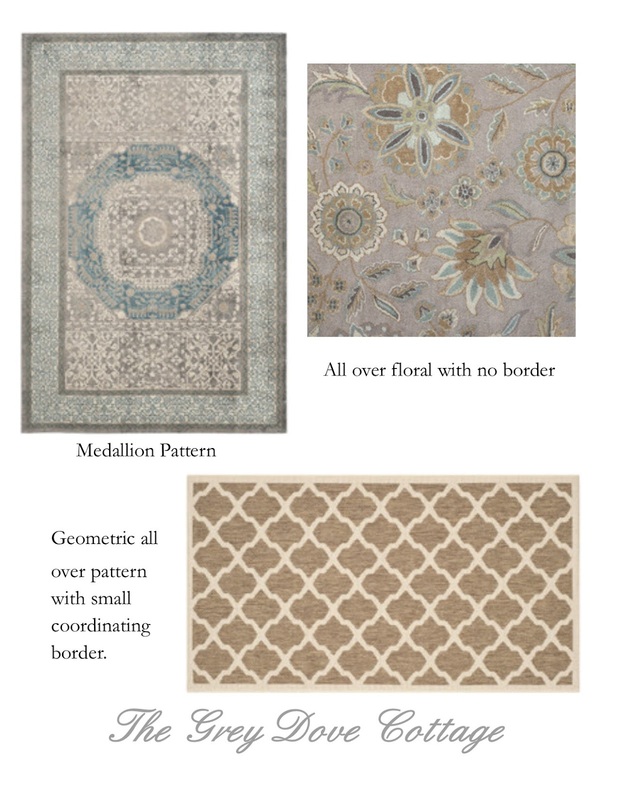 Choosing a rug with a beautiful center medallion may not be the best choice for a dining room, because the medallion will be directly under the table. Although I must admit, I gravitate toward center medallions. Having a oval table, the shape of our table would mimic an oval medallion rug pattern. I feel it is an option for Sybi. A border can be nice, creating a frame around the table and chairs. Finally, costs must be considered. While an expensive, thick pile, wool rug is luxurious under foot in a foyer, bedroom or living area, it seems a bit wasted hiding beneath a dining table. Inevitably in the dining room, a stubborn stain will occur. 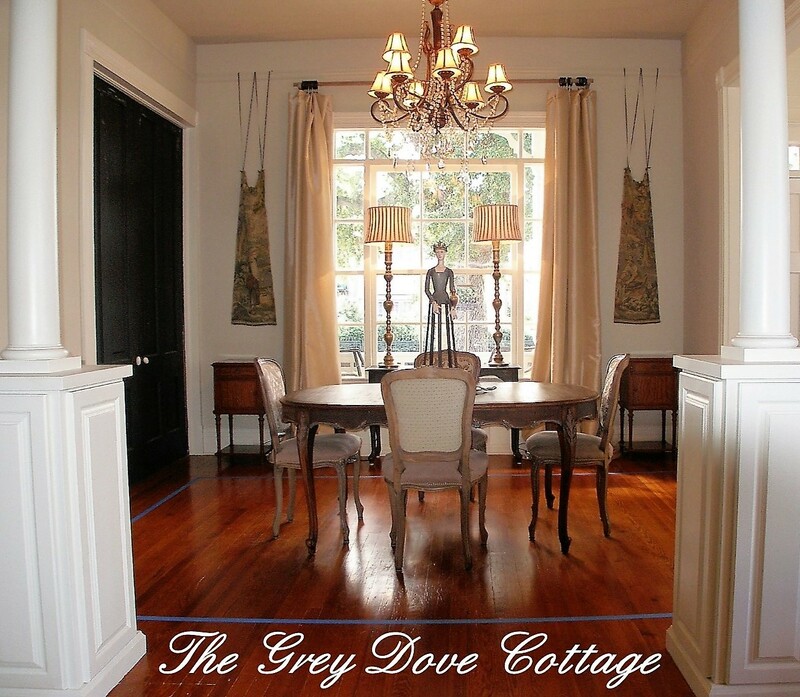 Using a thinner, less expensive rug in the dining room may prevent future heart ache. If that waterfall of Shiraz occurs, I’m less likely to gasp, and instead be a gracious hostess, "No worries, I was bored with the rug anyway! " This choice being a bit darker with an all over pattern that would hide stains well. I rather like the ship print for Mr. GDC's office, and the soft green lamp adds a subtle color to the foyer, also it will work well with the vintage basket foyer lamp. The colors carry upholstery already in place in the keeping room. This choice is synthetic for easier cleaning. Maybe a little too busy? An all over animal print would add a bit of a contemporary spin to Sybi's interior. The soft golden color would be a nice neutral background, infusing Sybi with warmth. Changing accents colors would be easy with this rug. The all over dotted pattern would be wonderful as literal stain camouflage. This choice is wool, cleaning might be a little tricky. 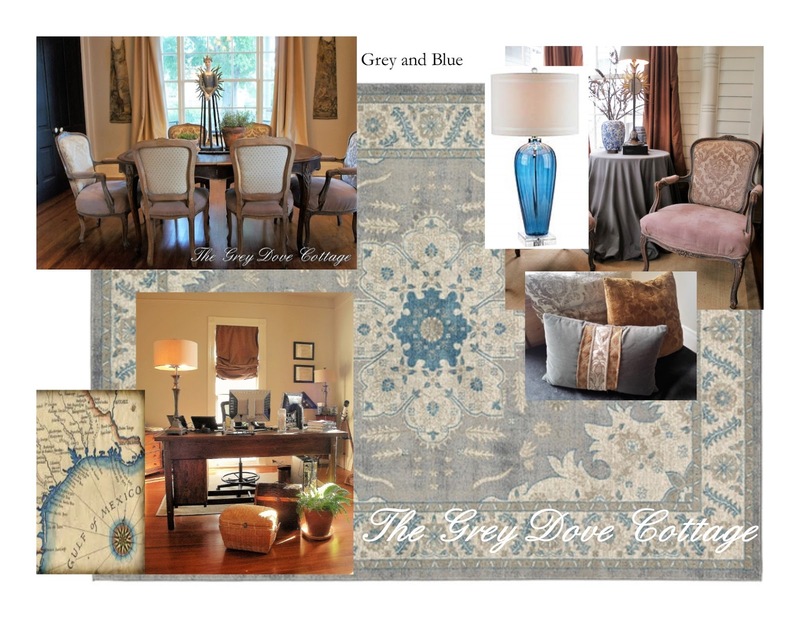 A bit softer color scheme of grey with blue would keep Sybi light and bright. The blue glass vase table lamp would add a contemporary edge to the foyer. The rug having an all over pattern would help to hide stains. This one is synthetic, clean up would be easier. Soft colors, also the light patterning would work well with the antique tapestry fragments. This choice provides just a hint of color. Maybe a map for Mr. GDC's office? We are on the Texas gulf Coast, a hint of ocean would be nice. This peacock blue hints of water. The center medallion would be somewhat lost under the oval dining table, yet the medallion pattern would mimic the oval shape. The border is busy, somewhat muted, which would hide stains well. This choice is synthetic for easy clean up. Notice the ship print and lamp are back. Really, like those! For my cousin who adores red, and will read this post, if there is no red choice will crinkle her forehead just above her nose. I don't want to be responsible for frown lines! Dark red. Honestly, it isn't as awful as I expected. This choice synthetic, with an all over pattern would certainly add color, while hiding stains. I know, longhorns. Mr. GDC has a rack of horns about 7' wide in this office. Heavy sigh. This may create a new design style "Texan French"! What a difference a rug choice makes. It is fun to experiment. Using software to create a story board helps to make the choice easier. Please leave a comment if you have an opinion on Sybi's rug choice. Clearly I'm having trouble committing. Hopefully, I’ll be back soon with a found treasure!